Published on 8 October 2012. 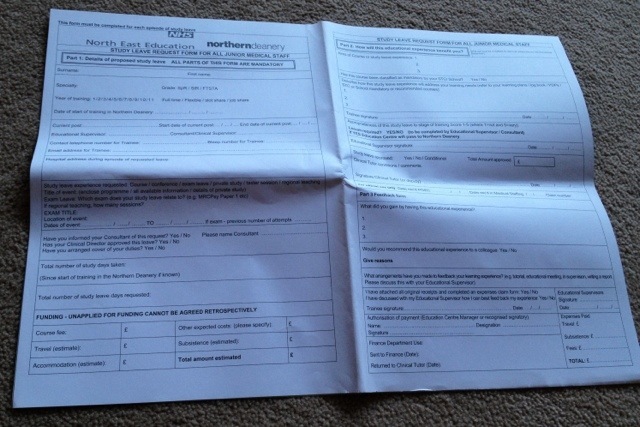 It seems hard to believe that here in the 21st century, I still apply for study leave by posting a carbon-copy quadruplet A3 sized form… It’s almost difficult to believe that the deanery can find a printer that still makes carbon copy forms, let alone that printing thousands of them is a cost-effective way of administering a process. And that’s before the cost of posting them back and forth is included! As I post this, I note that I missed posting a photo yesterday. Sunday seems to be the day I forget most frequently… I’m not sure why! I’ll post another later to make up the numbers! This 1,840th post was filed under: Photo-a-day 2012, Medicine.